The best spots to park your RV across the U.S.
Kelly O'Mara—Hitting the open road is an American dream. But doing it in an RV means that you can bring all your amenities with you. That’s living in luxury — virtually anywhere. RVing can be an ideal vacation for kids, and an inexpensive way to have that family vacation you always wanted. It may still be winter, but start planning for the roads ahead with these most searched RV vacation spots on Yahoo. The very last town in the long chain of islands that stretch into the Gulf off the tip of Florida, Key West is pretty much the end of the road. And, when you finally get down that road with your RV, Boyd’s is the only place to be. The campground is near downtown Key West and close to beaches for snorkeling, fishing, or just lounging. One note: Boyd’s was built back before RVs were the size they are now, so many big rigs find the space tight. Two miles northwest of Mount Rushmore in South Dakota, Horse Thief Lake is understandably a hot spot for camping.The Forest Service operates the actual campground around the lake, but there are only a few RV sites. Try the nearbyHorse Thief Campground and RV Resort, which offers a pool, bathhouse, playground, picnic areas, and a store. You’ll want to see Mount Rushmore, but also check out Jewel Cave, Harney Peak, and all the trails around the Black Hills National Forest. 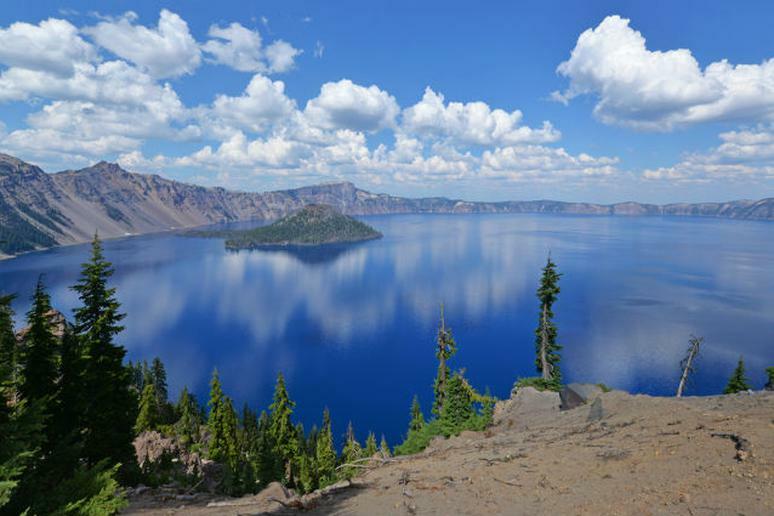 In southern Oregon, Crater Lake National Park is named for its massive water-filled crater. The lake is filled only with rainwater and snow, and goes down 1,900 feet. This makes it the deepest lake in the United States and one of the most striking anywhere. While the park itself has two campgrounds (one primitive and the other with access to electric hookups and water), Crater Lake RV Park — also known as Prospect RV Park — and Big Pines RV Park are viable alternatives with plenty of amenities. The summer is the most popular time to visit, so plan ahead and give yourself enough days to hike, bike, boat and even swim at the end of Cleetwood Cove Trail. On 750 acres between the Magic Kingdom and Epcot in Florida, Disney’s Fort Wilderness is a great place to stay while visiting the amusement parks and a great way to get your kids a little nature in addition to Mickey Mouse. The resort, as it is called, has all the amenities you could need. It even has boating and waterskiing around Bay Lake, archery and pony rides for the kids, volleyball and basketball courts, and a Wilderness Back Trail Adventure via Segway for the teens. Colonial Williamsburg, in Virginia, isn’t just a reenactment and it isn’t just a restoration. It’s a 300-acre historic area that attracts nearly 1 million visitors every year. Tour the blacksmith shop, let the kids play Revolutionary Era games, and watch live moments in America’s past. Because it’s such an easy drive for East Coasters and close to so many other attractions, Colonial Williamsburg makes for a popular RV spot — and there are lots of places to park. Stay at the American Heritage RV Park or Williamsburg KOA Campground. And, then visit the Jamestown settlement and Yorktown battleground for a full historical experience. The Columbia River covers 1,243 miles through Canada, Washington, and Oregon. The path it carves through the Columbia River Gorge is breathtaking and a great place to visit by RV. Get out, camp a bit, hike or kayak, and then head down the river to the next spot. The massive Columbia River National Scenic Recreation Area has its own camping and RV sites. There are also dozens along the river and around the Portland and Mount Hood areas, like Columbia River RV Park in Portland or the Columbia Riverfront RV Park, 22 miles outside the city. Keep going and you’ll get to the Rufus RV Park, if you really want a spot out in the middle of nature. Over 100 tidal and barrier islands stretch along the South Carolina and Georgia coasts. Among these Sea Islands, the Golden Isles in Georgia — made up of Jekyll Island, Sea Island, St. Simons Island, and Little St. Simons Island — are some of the most popular. Lounge on the windswept beaches, visit the historic districts, and eat delicious meals at the local resorts. On the mainland in Brunswick, you can stay at the Golden Isles RV Park. Alternatively, park yourself near the water on Jekyll Island. In the Florida panhandle, on a strip of land outside Pensacola, between the Gulf of Mexico and Choctawhatchee Bay, sits an RV vacationer’s paradise. Camp Gulf has cabins and RV sites situated right on the water. Their motto: You can’t get any closer than this. Maybe that’s why it’s been ranked one of the top RV parks by the Travel Channel. Play in the ocean, build sand castles, and enjoy a camp ice cream social. This is old-school fun on the beach. Visit the Vicksburg National Military Park in Mississippi, or take in the historic waterfront (and waterfront casinos). It’s an ideal spot for a summer drive and for enjoying a night under the stars. There are a half-dozen RV parks in the area, so you have your choice. The Rivertown Campground by the military park is a great outdoors spot, and Chotard Landing Resort is all about fishing the river. If you’re looking for more of an adult vacation, stay at the Ameristar RV Park to be ideally situated near the Ameristar Casino.